What about their maligned film relegated it the lower shelf of the animated canon? The mystery had intrigued me over the years. I had not been among the loyal few who saw it in theaters (I was barely four years old when it came and went without a trace), but legend persisted through catalogs of film study about a movie that began as a dream for a new generation of eager cartoonists, and then ended in a flurry of crushed hopes. Changing storyboards, fragmented sequences and long feuds between factions of animators had reportedly changed their brain child into a mess without cohesion. Then, in the 11th hour of a release, the arrival of a new CEO – Jeffrey Katzenberg – spelled deeper trouble; against the wishes of Hale, he took the film’s nearly-completed reels into the editing room and personally hacked out 12 minutes of footage (a rare practice for a fully-animated feature). The conventional wisdom, at least among those involved, was that the decision undermined the momentum of a movie that already moved aggressively between the pendulum of cheerful adventure and menacing doom, essentially pushing a production that was already perched on the razor’s edge into a nonsensical abyss. Katzenberg believed he had saved them all a worse fate, but history may speak for itself: after a $44 million budget, Disney’s 25th theatrical cartoon recouped little and was cast off into the vaults for 13 long years while animation moved in a much different direction. It was on that day in ’98 when I got my first look at their notorious failure and found, much to my surprise, a film I enjoyed far more immensely than I expected to. It certainly wasn’t a flawless endeavor, I concede. Pieces of it felt incomplete, almost rushed. Large passages of dialogue were repetitive, as if the voice actors were working in an impromptu recording session without script pages. But an adventurous undercurrent drove the material in a way that I did not expect, leaving me with a sense of startling joy. The images spoke from a deeper yearning; they were not fashioned from a style that recalled classic animation but forged from a collective chutzpah of men and women who sought to see the Disney name move out of cutesy shlock and into the grasp of cold fantasy. Some of it seemed, just as the source material had been, derived from Welsh mythology. I found a strange, almost perverse pleasure in that possibility. After seeing the studio find success in the palm of a formula that was dotted by musical numbers and accessible themes, a film about misfits attempting to destroy an artifact guarded by insane witches played as the antithesis of what was to be. That is not to dismiss any of the achievements Disney had made up to that point. Several of those films remain personal favorites. 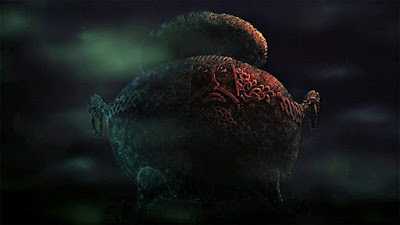 But “The Black Cauldron” impressed me – and even rose to cult status, I suspect – because it remains an uncultivated whole, from which few (if any) other cartoons by the studio have been influenced. To see it is to be in the company of a rare and refreshing original. The pieces that don’t work are innocuous, but its virtues have a sweeping enchantment to them. That spell has rarely diminished over time, and 20 years later I come back to it, still, to find its magic unchanged, undiminished, and affirming. It may be the greatest underdog of its time. But that afternoon also inspired, perhaps, a greater discovery: a need to record my own enthusiasm for films I loved. Following two viewings I wrote a brief analysis at the request of the same fan-site co-sponsoring the petition; they had heard of my passion for writing and were eager to get the perspective from an outsider who was vocal for a release. Hours later, that piece also became the first article I would publish on my own new web page, a lowly GeoCities account where I could talk about the movies, engage with others and expand my curriculum beyond a brief run as the movie critic of the high school newspaper (which began a year prior). Though it was not the first analysis I wrote, it was certainly the first that was done with a direct intention; I had entertained the idea of moving my new hobby onto the internet as a way of tapping into an emerging medium, and I firmly believe the enthusiasm I had for the likes of “The Black Cauldron” created essential groundwork for those aspirations. Over the following months, my first wave of essays frequently involved films that were not necessarily high on the priority list of serious journalists: old horror films, Disney movies, gross-out comedies and even childhood favorites. They were, for better or worse, sources of comfort; because I had seen many of them repeatedly, a thorough perspective had already lodged into my head as to what they delivered. Sometimes that took the form of pieces like the one I wrote for “The Black Cauldron,” where my eager demeanor was obvious. At other times that involved the opposite extreme, as it did with “I Spit on Your Grave,” a film that I visited primarily because of Roger Ebert’s claim that it had been the worst movie he’d ever seen; I was so distraught and sickened by the experience that I remember calling it “a literal disgrace to the cinema.” While I was hardly perceptive or refined about my skills for sarcasm, writing about bad films presented a deeper challenge: they forced me to adjust my own personal boundaries as to what qualified as passable entertainment. Some saw it as broad, others narrow. In those early years, when I engaged more with others on message boards and public forums, I recall taking a beating for my enjoyment of “Batman & Robin,” which I no longer consider good, and hating “Fight Club,” which still does not rouse my interest. If those experiences were valuable at shaping the voice that was to come two decades later, they served their purpose well – my tastes have both expanded and contracted under the influence of much more perceptive filters. The road, however, has often been obscured by the distractions of life. I began an existence on the Internet not to simply stroke an ego (although that was an added bonus), but to build a catalogue that could benefit me later, after I had finished school and sought a professional career as a critic. There was little doubt or uncertainty in that happening. A year prior, after receiving an assignment to do a review on current film releases, I realized both of my key passions – film and writing – were far more dynamic when they were combined. At times I pounded out three or four “freewrite” articles in a single day to test the theory. These exercises persisted well after public education and straight into college, where one of my articles even won me awards at a college newspaper conference. But changing times and declining readerships in print meant that the world outside could not provide gratification for my niche, as I had desired. It was never meant to be more than it already was. As my disappointment gradually eroded into resentment, I put distance between me and the Internet and floated between odd jobs for trade publications (and then found a steady paycheck in retail management). My interests wavered. Over the course of seven of those years, I wrote a total of 60 articles to, basically, meet a baseline goal. The expanding concept of “blogging” took off and seemed to undercut the identity of the earlier online critics. Fearing a world that was changing so rapidly, I lost touch with a circle of great colleagues and detached. Meanwhile, I began experiencing life from more literal perspectives, meeting people and engaging with them to grasp the varying perspectives of human interaction. I fell in love (a few times, it seems), experienced betrayal, developed cynicism, and learned empathy. And just as death and personal tragedies seemed to become a prison for my resting aspirations, I emerged from them not broken or resentful, but eager to speak again with a more informed outlook. Perhaps it took a glance in the mirror to realize that writing online was never meant to take me home, but that it offered a bedrock of comfort in times when the movie screen remained an optimistic window in a world of cruel contradictions. I have been consistent with that theory for five long years, in a time when my output remains fairly consistent (at least for someone who only does it in their spare time), unrestricted and often unpredictable. One of the great discoveries in this second act has also functioned as an admission: I know so little about the mechanics and philosophy of film that it has necessitated me to stray frequently away from current cinema, in a time when readership is usually dictated by how many current releases you review. While I certainly make conscious endeavors to visit the latest blockbusters or hot commodities on the big screen, my mind and heart unconsciously gravitate towards the very films that paved the road for them. I could hardly celebrate a recent great film like “Annihilation,” for example, without first recalling Andrei Tarkovsky’s “Stalker,” which contains many of its underlying influences. How could I, furthermore, talk about the audacious brilliance of “Hereditary” without mentioning that it essentially is derived from the early Polanski films (notably “Repulsion” and “Rosemary’s Baby”)? What you see now, on this blog, is less a record of current trends and more a document of how a film buff’s mind frequently wanders between the present and the past. If readership is undermined by those conflicting waves, it is a sacrifice I am willing to make for the expansion of my personal education. Social media, admittedly, has helped propel the continued exposure of my material, new and old. I was reluctant to indulge the various outlets when I had returned to the output stream in the summer of 2013, but the likes of Twitter and Facebook offer the sorts of exposure that reach beyond conventional outlets. Sure, anyone could simply go to Rotten Tomatoes and find my reviews linked to any particular movie’s page, but how would anyone know who I was? Or care? In these times where personality is an essential attribute, I had to learn how to handle the scope of my position beyond just the essays. Luckily, I have been able to keep pace with the demand without necessarily dwindling myself down to a proprietor of catchy soundbites, although that’s more out of disinterest than scorn. Others find a success with both that is admirable. I respect Scott Weinberg, for example, precisely because he is able balance each – he is a gifted writer and has a presence on Twitter that feeds the needs of that audience, without coming across as superficial or trivial. If two decades of presence on the Internet has not given me the chutzpah to be as interactive as some of the more prolific masters, it’s a position I must concede failure in. Yet I lumber along as I must, consciously aware that consistency is as important as quality. Whether I endure beyond the scope of trends is something that will be decided by how my space online ages over the next twenty years. There may be little consequence to what I do. I may just be an average, all-around movie enthusiast who talks too much. A boring voice in a climate where speaking loud and colorfully gets you farther. I don’t have access to movie stars, press junkets or premieres. My claim to fame is being indexed on the critic meter at Rotten Tomatoes, and being one of the earliest members of the Online Film Critics Society. I interviewed three actors and one filmmaker in my lifetime, and that suits me fine. I don’t seek to make what I do a full-time job that pays well. Not all my opinions match that of the majority, and sometimes I willingly take beatings for trashing the pictures others are vehemently proud of. But I do it all on my terms, with conviction, and an unwavering optimism for the movies – old and new. I publish annual volumes of my writing in digital and paperback not for fame or fortune, but for posterity. And as I continue through this wilderness of experience, I suspect little will change other than a few added layers of insight and sarcasm. I appreciate all of you who have followed me on the ride and hope you will join me in the phases that come next.